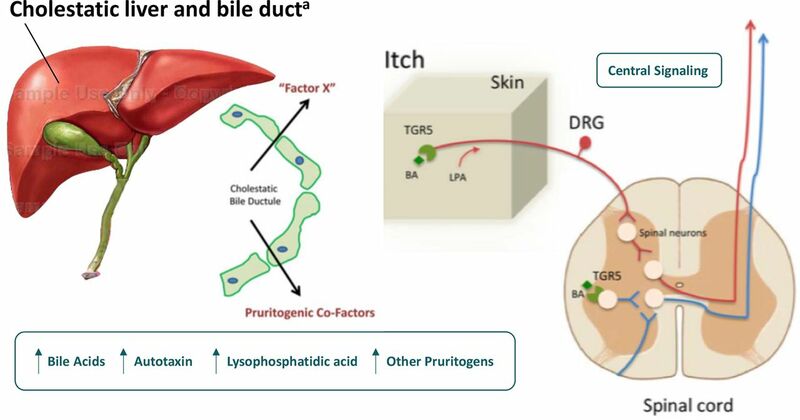 Background and aims This article provides expert guidance on the management of pruritus symptoms in patients receiving obeticholic acid (OCA) as treatment for primary biliary cholangitis (PBC). PBC is a chronic, autoimmune cholestatic liver disease that affects intrahepatic bile ducts. If not adequately treated, PBC can lead to cholestasis and end-stage liver disease, which may require transplant. Timely treatment is therefore vital to patient health. Pruritus is a common symptom in patients with PBC. Additionally, the use of OCA to treat PBC can contribute to increased pruritus severity in some patients, adding to patient discomfort, decreasing patient quality of life (QoL), and potentially affecting patient adherence to OCA treatment. Methods In May 2018, a group of physician experts from the fields of gastroenterology, hepatology, and psychiatry met to discuss the management of pruritus in OCA-treated patients with PBC. Recognizing the importance of optimizing treatment for PBC, these experts developed recommendations for managing pruritus symptoms in the OCA-treated PBC patient based on their experience in clinical practice. Results These recommendations include a comprehensive list of management strategies (including over-the-counter, prescription, and alternative therapies), guidance on titration of OCA to minimize pruritus severity, and an algorithm that outlines a practical approach to follow up with patients receiving OCA, to better assess and manage pruritus symptoms. Conclusions Pruritus associated with OCA therapy is dose dependent and often manageable, and with the proper education and tools, most pruritus cases can be effectively managed to minimize treatment discontinuation. One example of a potential pathophysiology pathway of pruritus in primary biliary cholangitis. BA, bile acids. DRG, dorsal root ganglia. LPA, lysophosphatidic acid. TGR5, Takeda G protein-coupled receptor aThis figure presents one potential pathway of pruritus that involves cholestatic liver disease. Several other potential pathways of pruritus have been presented in literature, in publications including Carrion AF, et al. Clin Liver Dis 2018;22:517–32, Sun Y, et al. Autoimmun Rev 2016;15:795–800, and Tey HL, et al. Br J Dermatol 2011;165:5–17. Figure adapted from Dawson PA. Hepatology 2014;59:1638–41 and Jones DE. Hepatology 2012;56:1194–6. Both of the most recently updated clinical practice guidelines, published by the AASLD and by the EASL, address the treatment of pruritus in PBC.6 13 These guidelines recommend bile acid sequestrants as the preferred initial therapy to treat pruritus, followed by rifampicin, oral opioid antagonists, or selective serotonin reuptake inhibitors (SSRIs). Both guidelines also recommend lifestyle interventions, such as the use of oatmeal extract or body moisturisers to soothe inflamed or dry skin, using cold water for baths or showers, and avoiding itchy clothing. The monitoring of symptoms is an essential part of pruritus management. Several scales are available to help patients quantify their symptoms, so that healthcare providers (HCPs) can monitor and modify treatment regimens.21 The Visual Analogue Scale (VAS)28 and the 5-D Itch Scale29 are commonly used in clinical practice to assess pruritus severity but were not developed as tools specific to PBC-related pruritus.21 Several questionnaires, specific to PBC, have been developed to assess patient QoL, such as the PBC-4030 and PBC-2731; these have been validated and are most commonly used as QoL measures in clinical trials. Pruritus is the most common adverse event in patients treated with OCA, and while patient liver biochemistries may improve, exacerbation of pruritus symptoms can lead to treatment discontinuation, thus impacting disease control.10 32 Results of the PBC OCA International Study of Efficacy (POISE) showed the efficacy of OCA for treatment of PBC in decreasing both ALP and bilirubin levels, as well as other markers of cholestasis, after 1 year of treatment.22 In this pivotal phase III study, patients were randomised to receive placebo (n=73) or OCA, either as an add-on to UDCA therapy or as monotherapy, with an initial daily dose of 10 mg (n=73) or 5 mg to be titrated to 10 mg, based on tolerability (n=70). This titration method demonstrated clear dose-dependent outcomes related to pruritus. At enrolment, 63% of patients had a history of pruritus and 59% of patients reported experiencing active pruritus symptoms. After 1 year of treatment, pruritus was reported by 56% of patients in the 5–10 mg group and 68% of patients in the 10 mg group, compared with 38% in the placebo group. In this study, pruritus was managed with a combination of medications (bile acid sequestrants or antihistamines), dosing interval change, study drug interruption, and non-drug treatments. While 10% of patients who initiated OCA at 10 mg doses discontinued treatment due to pruritus symptoms, treatment discontinuation due to pruritus symptoms occurred in only 1% of patients who initiated OCA 5 mg doses, who were uptitrated to 10 mg as appropriate based on side effect profile and biochemical response. This highlights the importance of clinical judgement for titrating the dose of OCA based on tolerability. At 12 months of treatment, the POISE primary endpoint (15% reduction in ALP, ALP lower than 1.67 times the upper range of normal, and normal total bilirubin levels) was achieved by 46% in the 5–10 mg group and 47% in the 10 mg group, compared with 10% in the placebo group, indicating that OCA can be used effectively to control PBC while individualising titration strategies to manage pruritus symptoms. Following 12 months of treatment, patients in POISE were invited to enter a 5-year open-label extension (OLE), during which all patients received an initial daily dose of 5 mg of OCA with the option of titration up to 10 mg after 3 months based on clinical judgement.22 In total, 97% of POISE patients completing the 12 months of treatment were enrolled in the OLE (n=193). To date, safety and efficacy results from the first 36 months of the OLE have been reported.33 During this time, patients sustained improvements in both ALP and bilirubin, as well as in markers of hepatic damage. Long-term safety data from the OLE showed that 4% of patients discontinued treatment due to pruritus symptoms during the 36-month extension trial. The roundtable meeting was sponsored by Intercept Pharmaceuticals. Eleven leading experts in the fields of gastroenterology, hepatology, and psychiatry, all with special interest in PBC, convened in San Diego, California on 23 May 2018. During the meeting, the experts discussed the most challenging aspects of managing pruritus in OCA-treated patients with PBC. They presented clinical case studies, which highlighted the successes and challenges experienced in the management of patients with PBC with pruritus. The experts discussed the priorities in addressing unmet needs related to pruritus management in OCA-treated patients with PBC. The recommendations discussed by the expert panel are summarised below. To improve disease outcomes, enable treatment adherence, and increase patient QoL, the experts recommended proactive pruritus management strategies, including patient education and counselling, to better set and manage patient expectations when experiencing pruritus in PBC. Box 1 presents a list of management options to be discussed with patients based on symptom severity. Taking cool showers/showering in the morning. Using clear/gentle soaps and laundry detergents. Application of cold packs or fabric strips soaked in cold water. Avoidance of wool and other potentially irritating fabrics. *These physical interventions are available as salvage therapies. Pruritus can have a psychological component, which can also affect other aspects of patient QoL and medication adherence. Focused attention on pruritus can actually intensify symptoms in some cases; however, this is not to suggest that pruritus severity is purely psychological, but rather that organic pruritus symptoms often exacerbate psychological challenges.34 Regardless of the aetiology, pruritus can be distressing for patients and affect psychological well-being. Pruritus symptoms should not be ignored, as they can be associated with increased risk for depression and suicidal ideation, particularly as the severity increases.35 Education and counselling about readily available options for pruritus management are vital for patient success in PBC management, especially for patients receiving OCA. When lifestyle and OTC medications are insufficient to address pruritus, there are a number of recommended prescription medications that can be used. Following the clinical practice guidelines, a bile acid sequestrant, such as cholestyramine, should be used as the first-line treatment response to pruritus; however, this treatment decision should be individualised and take into consideration the potential for drug interactions.6 13 The recommended starting dose for cholestyramine is 4 g per day, with titration up to 16 g per day as needed and tolerated.6 If a patient is prescribed both a bile acid sequestrant and UDCA, these medications should be taken 2–4 hours apart; similarly, because bile acid sequestrants may prevent absorption of OCA, these medications should not be taken within 4 hours of each other.8 36 Additionally, some patients experience issues with cholestyramine tolerability, citing an unpleasant taste and gastrointestinal side effects as reasons for discontinuation.36 An alternative to cholestyramine use is colestipol, which some patients may find more palatable. If bile acid sequestrants are inappropriate for a patient, or if they are insufficient in addressing the symptoms of pruritus, the recommended second-line treatment is rifampicin, a pregnane X receptor agonist. Rifampicin is associated with hepatotoxicity in some patients and should be initiated at a quarter dose and titrated slowly with careful monitoring of liver biochemistries.36 Rifampicin can be given at doses of 150–300 mg twice daily as tolerated; however, rifampicin should not be used in patients with bilirubin levels >2.5 mg/dL.6 The recommended third-line treatment for pruritus is naltrexone, an opioid antagonist, which should also be initiated at a quarter dose and titrated up based on tolerability.36 Naltrexone should be initiated at a dose of 12.5 mg daily, and uptitrated every 3–7 days to reach the full dose of 50 mg per day.6 Although uncommon, there is a potential for naltrexone-related hepatotoxicity, and patient liver biochemistries should be monitored with naltrexone use. However, several experts on the panel expressed uncertainty about prescribing rifampicin and naltrexone due to potential side effects of liver toxicity. Although these medications are recommended by the clinical practice guidelines, they should be used with caution and with careful follow-up. If these medications are insufficient or not well tolerated, SSRIs, such as sertraline, are a fourth-line option.36 Sertraline has been shown to reduce pruritus symptoms at 75–100 mg doses, which must be achieved through titration.6 Although recommended in the guidelines as a fourth-line option, experts on the panel deemed sertraline extremely helpful, and several experts recommended its use earlier in the course of pruritus treatment. The experts also reported some success with the use of gabapentin for pruritus management, and while this medication is not in the AASLD clinical practice guidance the EASL guidelines do discuss its potential use for treatment of pruritus.13 Few data exist, however, on the use of gabapentin for pruritus in patients with liver disease, and a small study from 2006 found no benefit for this use of gabapentin, compared with placebo.37 Nevertheless, gabapentin, as well as SSRIs, may be used empirically in clinical practice.13 Because PBC and PBC-related pruritus are sometimes associated with psychological factors, such as fatigue, emotional issues, sleep disturbance, and depression, the use of an SSRI may have the added benefit of addressing these symptoms.6 19 Additionally, clinical data show an effect of sertraline on pruritus relief independent from improvement in depression symptoms.21 A careful psychiatric history should always be undertaken whenever prescribing antidepressants. The panel discussed sertraline dosage, and the experts recommended a starting dose of 25 mg, with titration of sertraline until the full dose is achieved, although in the experience of the expert panel the low dose is sufficient for most patients who will respond. Antihistamines, such as hydroxyzine, can also be used to alleviate pruritus symptoms6; however, recent evidence indicates that hydroxyzine use is associated with a rare increased risk for QT interval prolongation and may cause torsade de pointes in patients with increased cardiovascular (CV) risk (baseline QT prolongation).38 As such, hydroxyzine should be used with caution in patients with a history of CV risk factors and avoided if patients experience QT prolongation; for these patients, other antihistamine or treatment options may be preferable. A number of experimental physical interventions are available as salvage therapies for patients who do not respond to other pruritus treatments.6 13 Of these, ultraviolet light therapy with a 10 000 lux light box is the most accessible to patients.13 Other physical options include nasobiliary drainage of bile salts, albumin dialysis, and plasmapheresis, all of which need to be implemented at specialty centres.13 21 While these options may require referral to a specialty centre, they should be considered as salvage therapy in OCA-treated patients with refractory pruritus. Follow-up is important after the initiation of pruritus management strategies to evaluate patient QoL and provide further support, as well as to evaluate the effectiveness of pruritus management and ensure adherence to PBC medication. If patients do not respond well to pruritus management strategies, OCA dose reduction or maintaining lowered dosages should be considered an option. There are several titration strategies that may help manage pruritus in patients who receive OCA, including delaying uptitration from 5 to 10 mg doses, taking a temporary down excursion from 10 to 5 mg doses, and temporary discontinuation of OCA until pruritus is controlled, followed by restarting medication with a slower uptitration. Figure 2 shows a practical guide to titration of OCA based on pruritus severity, as discussed by the expert panel. Pruritus severity can be difficult to quantify; clinicians may want to use itch scales such as the 5-D Itch Scale or VAS, which evaluate itch but were not developed for PBC.21 PBC severity tools, including the PBC-40, or the shorter and more quickly administered PBC-27, cover all aspects of PBC and have only four and three questions related to itch, respectively.30 31 The panel noted that pruritus may be subjective and have an aspect of clinical judgement in its diagnosis. The panel members did not have a specific scale that they used or recommended; however, for clinicians interested in scoring patients individually, the previously mentioned analytical tools can be used for patient management by employing the same scale at baseline and follow-up visits. It is important to note that making a clinical judgement on upward or downward titration, or temporarily pausing treatment to help alleviate symptoms, may not depend solely on pruritus symptoms but may also depend on the presence or absence of cirrhosis, or other markers of PBC disease progression. For example, OCA is not recommended for patients with decompensated PBC, and patients who have moderate or severe liver impairment (Child-Pugh B or C) should receive once-weekly doses of OCA 5 mg to start, with uptitration to twice-weekly doses if the drug is tolerated.6 8 While patients with non-cirrhotic or compensated Child-Pugh A may titrate up to daily 10 mg doses of OCA, the maximum dose for patients with Child-Pugh class B or C is 10 mg doses twice a week, with 3 days between doses.8 The benefits of dose changes, whether temporary or permanent, for pruritus management should be weighed against the PBC disease progression risks. 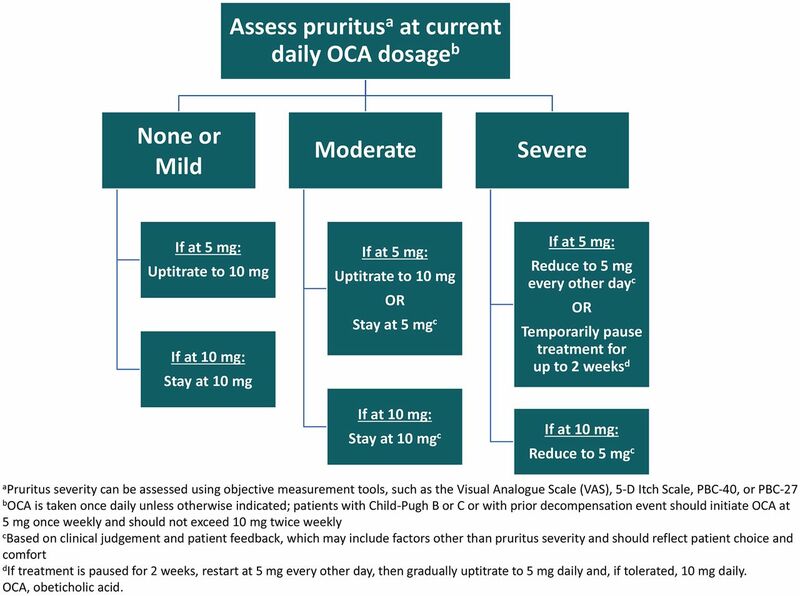 However, the expert panel expressed that at any time throughout treatment with OCA, any patient experiencing pruritus should have a choice to reduce or pause OCA treatment as necessary to help manage symptoms, in consultation with their clinicians, particularly for those patients experiencing moderate to severe pruritus. The panel felt that patients should be considered a partner in disease management and in managing adverse events, and should have an equal voice in treatment decision-making, including starting, stopping, and modifying treatment dosage. A clinical judgement for daily dosing process in OCA titration to manage pruritus symptoms. aPruritus severity can be assessed using objective measurement tools, such as the Visual Analogue Scale (VAS), 5-D Itch Scale, PBC-40, or PBC-27. bOCA is taken once daily unless otherwise indicated; patients with Child-Pugh B or C or with prior decompensation event should initiate OCA at 5 mg once weekly and should not exceed 10 mg twice weekly. cBased on clinical judgement and patient feedback, which may include factors other than pruritus severity and should reflect patient choice and comfort. dIf treatment is paused for 2 weeks, restart at 5 mg every other day, then gradually uptitrate to 5 mg daily and, if tolerated, 10 mg daily. OCA, obeticholic acid. To aid clinicians who treat patients with PBC in the initial management of pruritus and patient follow-up, figure 3 provides a practical approach to assist clinicians in treating patients with pruritus, developed by the panel during the roundtable discussion. 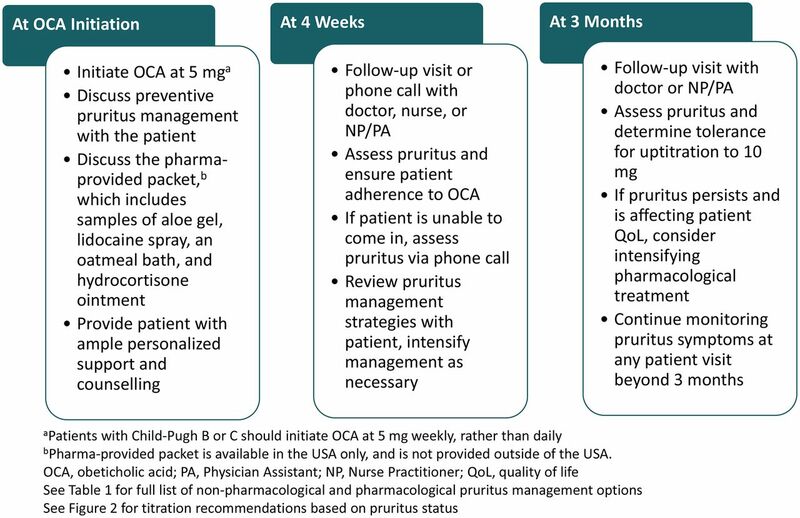 This algorithm for pruritus management begins with proactive education at the prescribing and initiation of OCA, and includes reconnecting with patients within 4 weeks of treatment initiation or at the time of the first refill, and again at 3 months, to evaluate the presence of pruritus and treat if indicated, assess patient QoL, provide patient support as needed, and ensure treatment adherence. Algorithm for the Management of Pruritus in OCA-Treated patients. aPatients with Child‐Pugh B or C should initiate OCA at 5 mg weekly, rather than daily. bPharma‐provided packet is available in the USA only, and is not provided outside of the USA. OCA, obeticholic acid. PA, Physician Assistant. NP, Nurse Practitioner. QoL, quality of life. See Box 1 for full list of non-pharmacological and pharmacological pruritus management options. See Figure 2 for titration recommendations based on pruritus status. This algorithm outlines individualised pruritus management for all OCA-treated patients, regardless of symptoms, and can be used in conjunction with box 1 and figure 2 to determine a course of pruritus management. The expert committee noted that most of the tools available for assessment of pruritus were developed for research purposes and may not be practical for routine use in clinical practice. However, monitoring symptoms can be as simple as asking a patient whether they are experiencing itch at each visit. Once a patient identifies that they are indeed experiencing itch, it is useful to quantify itch so that it can be monitored for improvement or worsening. With proactive, clinician-led education and counselling, active follow-up to assess pruritus, and implementation of lifestyle management and OTC treatment, as well as prescribed pharmacological treatment and dose titration, as necessary, HCPs can help support patients in continuing OCA treatment while managing pruritus symptoms. Pruritus is a common symptom in patients with PBC and may be exacerbated by PBC pharmacotherapy. OCA has shown a sustained efficacy and safety profile at 48 months, effectively improving liver biochemical parameters in PBC.33 Pruritus associated with OCA therapy is dose-dependent and often manageable, and clinical studies show that treatment discontinuation can be minimised when pruritus is managed effectively. There are a variety of measures that HCPs can put into place to manage and improve pruritus, to ensure maintenance of OCA and optimal disease outcomes. Individualised management strategies include close patient follow-up, non-pharmacological and pharmacological treatments available to manage treatment-related pruritus, and titration of OCA dosing as necessary, based on clinical judgement. While severe pruritus can be a challenge to continued therapy, it can be successfully managed in most patients, to help ensure the continuation of treatment. Effective and successful management of PBC depends on timely initiation of and continued adherence to pharmacotherapy to avoid disease progression.1 3 With education and personalised patient care, physicians can help improve pruritus symptoms and treatment adherence for optimal disease management. The authors thank Aimee Spevak, MPH, from CPE Communications, for medical writing and editorial assistance, which was sponsored by Intercept Pharmaceuticals.
. Primary biliary cholangitis (primary biliary cirrhosis). In: StatPearls. Treasure Island (FL): StatPearls Publishing LLC, 2018.
. prescribing information. Bridgewater NJ: Aptalis Pharma US, 2013.
. prescribing information. New York NY: Intercept Pharmaceuticals, 2016.
, 2018. Phase 4 study of obeticholic acid evaluating clinical outcomes in patients with primary biliary cholangitis (COBALT). Available from: https://clinicaltrials.gov/ct2/show/NCT02308111 [Accessed 27 Jul 2018].
. Update on new drugs and those in development for the treatment of primary biliary cholangitis. Gastroenterol Hepatol 2018;14:154–63. European Association for the Study of the Liver. EASL Clinical Practice Guidelines: the diagnosis and management of patients with primary biliary cholangitis. J Hepatol 2017;67:145–72. , 2018. Available from: https://www.accessdata.fda.gov/drugsatfda_docs/label/2016/204475Orig1s000lbl.pdf [Accessed 9 Oct 2018]. Contributors JP, JAG, CTF, AG, SK, RAM, EAM, PJP, SKS, KKY and RGG participated in an Advisory Board Meeting in May 2018 and contributed significant efforts to develop and present patient case studies highlighting successes and challenges associated with the management of OCA-induced pruritus. These case studies and the Advisory Board discourse became the basis for this manuscript. All authors contributed to the development of the article, revised the manuscript critically for important intellectual content, approved the final version to be published, and agreed to be accountable for all aspects of the article. All authors had full access to all data and had sole discretion in the data interpretation, writing of the manuscript, review and approval prior to submission, and decision to submit for publication. Funding Support for the roundtable panel discussion was provided by Intercept Pharmaceuticals. Competing interests JP received honoraria as an advisory board member from Intercept Pharmaceuticals and served on the speaker’s bureau for Intercept Pharmaceuticals. JAG received honoraria as an advisory board member from Intercept Pharmaceuticals; and performed as a consultant and advisor for AbbVie, Alexion Pharmaceuticals, Dova Pharmaceuticals, Gilead Sciences, Grifols, Intercept Pharmaceuticals, MediciNova, Merck, and Novartis. He is a speaker for AbbVie, Alexion Pharmaceuticals, Dova Pharmaceuticals, Gilead Sciences, Intercept Pharmaceuticals, and Merck. CTF received honoraria as an advisory board member from Intercept Pharmaceuticals; is a consultant for Conatus Pharmaceuticals, Gilead Sciences, and Wako Chemicals USA; provides research support for GENFIT; served on advisory boards for Eisai, Gilead Sciences, and Wako Chemicals USA; and served on speaker’s bureaus for AbbVie, Dova Pharmaceuticals, Gilead Sciences, Merck, and Salix Pharmaceuticals. AG received honoraria as an advisory board member from Intercept Pharmaceuticals. SK received honoraria as an advisory board member from Intercept Pharmaceuticals. RAM received honoraria as an advisory board member from Intercept Pharmaceuticals. EAM received honoraria as an advisory board member from Intercept Pharmaceuticals. PJP received honoraria as an advisory board member from Intercept Pharmaceuticals, and Scripps Health has received research support from Intercept Pharmaceuticals for trials where PJP is the principal investigator. SKS received honoraria as an advisory board member from Intercept Pharmaceuticals; served on speaker’s panels for Alexion Pharmaceuticals and Dova Pharmaceuticals; served on advisory boards for AbbVie, Bayer Pharmaceuticals, and Gilead Sciences; and received grant funding from Conatus Pharmaceuticals, Dova Pharmaceuticals, GENFIT, Gilead Sciences, and Shire. KKY received honoraria as an advisory board member from Intercept Pharmaceuticals. RGG received honoraria as an advisory board member from Intercept Pharmaceuticals; performed as a consultant and/or advisor for Abbott, AbbVie, Alexion Pharmaceuticals, Arrowhead Pharmaceuticals, Bayer Pharmaceuticals, Bristol-Myers Squibb Company, ContraVir Pharmaceuticals, Eiger BioPharmaceuticals, ENYO Pharma, eStudySite, Genentech, Gilead Sciences, HepaTx, Hoffmann-La Roche, Intellia Therapeutics, Ionis Pharmaceuticals, Janssen Pharmaceuticals, MedImmune, Merck, and Shionogi; served on advisory boards for AbbVie, Arrowhead Pharmaceuticals, Bayer Pharmaceuticals, ContraVir Pharmaceuticals, Dova Pharmaceuticals, Eiger BioPharmaceuticals, ENYO Pharma, Janssen Pharmaceuticals, MedImmune, Merck, Novira/Janssen/Johnson & Johnson, Shionogi, and Spring Bank Pharmaceuticals; served as a clinical trial advisor for eStudySite; chaired an advisory board for Arrowhead Pharmaceuticals; is a consultant for BioCollections, Prometheus Laboratories, Quest Diagnostics, and Theranos; served on the Data Safety Monitoring Boards for Ionis Pharmaceuticals, Transgene, and TRImaran Pharma; and is contracted to lead promotional talks for AbbVie, Alexion Pharmaceuticals, Bayer Pharmaceuticals, Bristol-Myers Squibb Company, Gilead Sciences, and Merck.